League rugby swings back into action tomorrow, giving club supporters the chance to get behind their local teams after the hurly burly of the Six Nations. An Aberdeen school has been praised for its work with youngsters and its “open and creative” culture. Aberdeen Grammar will end the year in a strong position to force home their top-four aspirations should they beat Kelso tomorrow at Rubislaw. Aberdeen Grammar had to dig deep against a Kirkcaldy side who simply refused to give in, only easing past the Fifers late in the second half to win 27-25. Aberdeen Grammar start the second half of their National League 1 programme tomorrow with a testing game away to Jed-Forest. Aberdeen Grammar slumped to their sixth defeat in 10 starts, leaving the prospect of a top half finish in National League 1 hanging by a thread. Aberdeen Grammar came within two minutes of a Border double at Selkirk, only to have the game cruelly snatched away from them. North-east pupils have received first-hand experience in energy industry training. 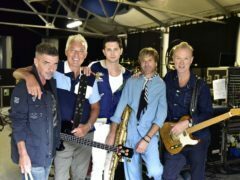 Spandau Ballet have returned to the stage with a new lead singer, following the departure of frontman Tony Hadley. To represent your country in the sport you love is always a great achievement. Grammar chairman Mike Cox thinks being without a north-east Super Six side will preserve the “status quo”. Aberdeen Grammar’s penultimate game of the season with derby rivals Dundee High today gives both Caley sides the opportunity to end the season on a positive note. Aberdeen Grammar head into the finishing straight of a long campaign in National League 3 tomorrow. Aberdeen Grammar endured a tough time on the road in Glasgow. Aberdeen Grammar travel to Glasgow to face GHA tomorrow with a depleted squad due to a number of players having booked a trip to Rome. UPDATE: Aberdeen Grammar’s National League 1 match with Musselburgh at Rubislaw tomorrow has been called off due to the Arctic conditions in the North-east. Gordonians had no scheduled game in National League 3 this weekend. More than a dozen Aberdeen teachers are set to scale three of the highest mountains in the UK after being inspired by the successful cancer treatment of one of their pupils. Aberdeen Grammar failed to make it a Border treble against promotion-seeking Jed-Forest after giving the home side a head start of 33-7 at Riverside Park. Aberdeen Grammar will head to Jedburgh tomorrow seeking a third win on the trot against Border opposition, but with a word of warning from head coach Ali O’Connor. Aberdeen Grammar get back into action tomorrow after a two-week break with what head coach Ali O’Connor regards as a “must win” game against lowly Stewart’s Melville. Aberdeen Grammar get their National League 1 programme up and running tomorrow, keen to build on their top-four placing in the first half of the season.